Since its founding in 1993 with 30 students in a Swissvale home, Imani Christian Academy has provided a faith-based education to underprivileged students in grades K through 12. Imani students have come from the adjacent East Hills housing complex and nearby low-income neighborhoods. A strong Christian identity has been embedded in the school since the beginning. It was originally founded by Petra International Ministries and Bishop Donald Clay. But it appears that Imani’s current leadership may now be setting aside its Christian mission in order to qualify for public funding by transforming the private religious school into a public charter school. Imani’s charter application appears to follow a trend by other religious schools nationally in recent years. After struggling financially to stay afloat, some have chosen to transform into charter schools to create a steady revenue flow, even though it requires giving up their religious mission. Such transitions have occurred or are in the process in other states, including Florida and Tennessee and in Washington, D.C. Often the schools, like Imani, are those that serve poor or minority communities. 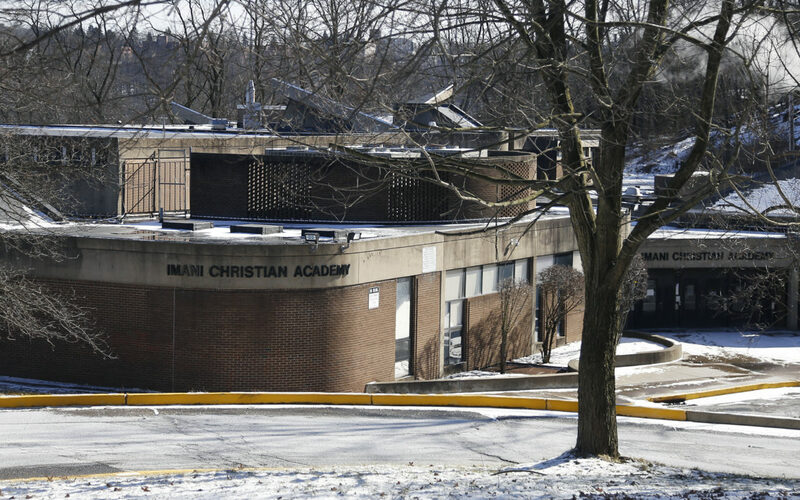 Imani CEO and Head of School Paulo Nzambi has filed an application with the Pittsburgh Public Schools board to start the Imani Academy charter school at 2150 East Hills Drive, the location of Imani Christian Academy. The application calls for the charter school to start operation in fall 2019. Private religious schools in Pennsylvania generally rely on a mixture of funding that includes tuition, fundraising and, in some cases, funding from the state’s Education Improvement Tax Credit program. Imani holds an annual gala as its major fundraising event. But charter schools receive a steady influx of public dollars. The money comes from the tuition school districts must pay for each student from their district who attends a charter school. The Pittsburgh school board held a public hearing on Imani’s application in December and, on Feb. 5, the district’s review team will present its report on the application. The board is scheduled to vote on the application at its Feb. 27 meeting, according to district solicitor Ira Weiss. Pittsburgh Public Schools officials declined to comment on the application until the review team presents its findings. Nzambi could not be reached for comment about the charter application. David Berardinelli, an attorney who is listed as one of six founding members of the proposed Imani Academy, said neither he nor others associated with Imani could comment on the application while the district is reviewing it. Berardinelli is also a board member of Imani Christian. According to its form 990 filed with the IRS for 2014, the school’s $4 million in expenses exceeded revenue by $402,379. The following year, the school had a $354,689 surplus. But in 2016, the most recent filing available, the school’s $2.8 million in expenses exceeded its revenue by $526,292. The 2016 form lists $2.8 million in assets, of which $2.4 million is in the equipment and its building; Imani purchased the building from the Pittsburgh district for $1 million in 2008. The form also lists $739,139 in secured mortgages and notes. In 2017, Nzambi told state officials that a delay in the distribution of funding from the Education Improvement Tax Credit program that year caused the school to use a line of credit to pay bills. If Imani’s charter is approved, it would be required to drop any religious component in its educational program. Under the state charter school law, all schools must be “nonsectarian in all operations.” As a charter school, Imani Academy would not be permitted to display any religious objects or symbols on the premises of the school. Ana Meyers, executive director of the Pennsylvania Coalition of Public Charter Schools, said Imani is the first religious school she is aware of in Pennsylvania to make a charter application. Imani’s enrollment has fluctuated over the years. The charter application calls for starting Imani Charter Academy with 230 students in grades K through 12 at the school building it already inhabits. According to the state statistics, Imani Christian Academy enrolled 198 students in the 2017-18 school year. That total was down from 229 in 2015-2016. But the lowest enrollment number in the last 13 school years reported by the state was 150 in 2013-2014. The highest enrollment during that time was 264 in 2009-2010. Imani’s leaders submitted the charter application to the Pittsburgh school board because the school is located in Pittsburgh. But it’s unclear how many Imani students are from the Pittsburgh district. As a charter school, Imani would be required to administer state tests and post the results publicly. Students would be required to take the Pennsylvania System of School Assessment exams to students in grades 3-8 and the Keystone exams in algebra, English and biology to secondary students. Private schools are not required to publicly report scores on academic achievement tests. Conversions to charter schools have taken different forms for religious schools in other parts of the country. A study by Seton Education Partners of Catholic schools that converted to charter schools in Miami showed that it proved beneficial for financially ailing schools and parishes that were serving largely the Latino community. In the 2009-2010 school year, the Catholic Diocese allowed financially struggling parishes operating eight schools to pursue plans to close the schools and lease the buildings to charter schools. Seton Education Partners is a national Catholic group that seeks new ways for Catholic schools to create sustainable models in areas where they educate underserved children and face financial obstacles. The parishes chose charter operators that had academic and character-building programs similar to the Catholic schools and who allowed the parishes to use the buildings during after-school hours for religious instruction and activities. While some families left because the schools were no longer Catholic schools, new students enrolled, in some cases creating enrollments higher than before the conversion. Six Catholic schools in Memphis, Tennessee, are converting to charter schools in the Compass Community Schools system. The schools were part of the Jubilee Catholic Schools Network, which serves low-income families. In Washington, D.C., Holy Name Catholic School converted to a charter school as did six other Catholic schools in the D.C. area in 2008-2009. The move to a charter school would mark the second transformation in management for Imani. In 2012, Imani severed its ties with Petra International Ministries when Petra representatives were voted off of the board of directors and nine employees associated with the ministry were fired. The dispute centered around whether religion and spirituality should take precedence over academics in the classroom. Despite the split, the school maintained its Christian educational mission. Founding members of Imani Academy, who are also board members of Imani Christian, are: Berardinelli, Cliff Benson, current chairman of the Imani Christian Academy board and retired chief development officer of the Buffalo Sabres and Buffalo Bills; Laura Ellsworth, a partner with the law firm Jones Day; Susan Maloney, a senior manager at Baker Tilly Virchow Krause; James D. McKinney Jr., president and chief financial officer at McKinney Properties; and retired educator Lillie Sipp. According to the charter application, Imani Academy will seek to educate “underserved urban students” and will have a “civic leadership curriculum,” which will focus on academic achievement and require students to perform community service. The application does not call for religious values to be taught in the classroom, though the personnel budget lists a comparative religion teacher and the list of proposed teachers includes a middle/high school religious studies teacher. The application does not include any information on who will lead the school, though there is a place in the application for that information. The application refers to an addendum that is supposed to include the resumes of “key personnel.” The addendum does not include that information. The charter application lists a proposed salary of $145,000 for the CEO/head of school. Imani Christian Academy does not list a salary for the head of school on its IRS form 990. The charter application calls for teachers at Imani Academy to be paid $40,000 annually and for a high school principal to earn $85,000 annually. This story was fact-checked by Dale Shoemaker. We analyzed teacher salaries at charter schools. Here’s what we found. If you’re a charter school teacher, chances are your salary is lower than your counterparts in a traditional school districts. No cyber charter school operating in Pennsylvania has reached the performance benchmark of 70 percent on the state's School Performance Profiles.